WHAT'S NEW IN THIS VERSION OF BENCH2 ? Changed the referent device: from Sony Clié N770C to Palm Tungsten C, so I had to run all timings again! Complete rewrite of the Bench2 routine to better benchmark the development tools. Thanks to all of the people who provided me with sharp analysis, bright comments and good ideas. As a consequence, I highly updated this web page! Provide a simple but quite rich example of a routine in different languages, for educational purposes. As a result, the comparizon of the different source codes provided on this page is very interesting. In order to give a playful purpose to the writing of the same routine in different languages, try to evaluate compilers & interpreters efficiency, designed to work on the Palm OS environment where performance and speed are of key importance. This is a very good idea and initiative, but this benchmark is fairly limited as it only tests for single decrementations and incrementations loop on integer numbers. Furthermore, an intelligent compiler will easily find out that the x and y variables are not used afterwards so it will just skip the execution of the loop (this is the case with the newest version 8 of CodeWarrior... a Delphi compilation would give a warning message and let the programmer decide for the action to take). Note : "div" stands for "integer division"
The first 4 perfect numbers are: 6, 28, 496 and 8128. Since we look for perfect numbers between 2 and 500 or 1000, P should hold 3 at the end of the benchmark routine. If this were not the case, a time of 0 second will be returned, thus giving the code error signification. Furthermore, this reuse of the P variable makes sure that an intelligent compiler will not detect that this variable is never used after it has been provided with a value. Keep the benchmark program as simple as possible to allow a real comparizon between the different languages. Keep it as similar as possible, try to avoid optimizations like inc(P) instead of P:=P+1 in Pascal or S+=D instead of S=S+D in C. I do not know if this has an impact on performance, but I think that it is easier to compare the routine in the different language this way. Floating point and integer numbers management in Palm OS is a tricky subject and it brought me a lot of e-mails and comments when I released the initial Bench2 routine that was not doing the modulo test. The DragonBall processor has a native management for 16 bit integers on which some development tools rely when others have developped a 32 bit integers management. So, of course, the second ones can be a little bit slowlier in execution (but not always, for instance PocketStudio runs just as fast using the integer type or the longint type). Most tools rely on the Palm OS APIs for managing float numbers and the same remark as for the integer numbers is valid for simple float numbers or double float numbers. I finally decided to work with the default integer and floating point types provided by the different development tools for the Bench2 test (but, for example, OnBoardC runs faster with the Double type than with the Float type). This is justified by the fact that we are taking into account our second objective (a routine that an average amateur programmer could possibly write, not especially optimized but giving the same right result) with particular attention. The loop [ if (N modulo D)=0 then S = S+D ] (work on integer numbers - this is the add-on analysis in Bench2 version 2) runs for as much as four times, 249001 times, than the one with [ if (N/D)=(N div D) then S = S+D ] (work on float numbers - this was the only analysis made in Bench2 version 1) which runs 62001 times. This is to take into account comments and feedbacks that came to me after I had posted version 1 of Bench2. Indeed, I was nicely told and I acknoledge that benchmark on floating point number is not always significative. Therefore, Bench2's total benchmark time will be level-headed with this different number of loops execution. All times given here are those found on my Palm Tungsten C (400 MHz XScale processor) when running Bench2, either stand-alone PRC program (for compilers), using a runtime (for pseudo-coded languages) or within the interpreter's IDE. the tools running in 68k mode (PACE) are in Blue, those running in native ARM mode are in Red. (*) : picoBASIC and Sun MIDP only work with integer numbers and they do not have a float numbers management. This is why loop [ if B=1 then if (N/D)=(N div D) then S = S+D ] cannot be run as is. Replacing it with [ if B=1 then if (N-(N/D)*D)=0 then S = S+D ] gives a a way of not removing these two development tools from the Bench2 comparizon even if they cannot then be compared exactly with the others. 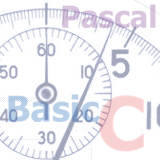 (**) : Palm Basic does not have a modulo operator. This is why loop [ if B=2 then if (N modulo D)=0 then S = S+D ] cannot be run as is. Replacing it with [ if B=2 then if (N-(N div D)*D)=0 then S = S+D ] provides with an equivalent formula. As you could see when reading the previous charts, the results are different depending on what you consider. None of the 3 analysis (overall Bench2 with 1st and 2nd loops, 1st loop only or 2nd loop only) gives the same podium. We easily get to see a huge gap between the very first timing (PP in ARM mode) and the very last one (picoBASIC Integer in 68k mode) : 0.21 seconde to be compared to 20521 secondes. This is a gap of more than 5 hours 42 minutes when the first one runs in less that a quarter of a second!!! If we take into account the second timing (CodeWarrior in 68k mode at 1.19 secondes) and the last "reasonable" one (Palm Tcl in 68k mode at 810.85 secondes), thus considering that the extremes results are not significative, we still find ourselves with a huge gap of almost 13 minutes and a half to be compared with 1.19 secondes !!! Without any surprise, we see that compiled languages are the fastest ones, ahead of the runtime ones, themselves performing better than the interpreted ones. I am personally quite happy to see that my own HELP, µBAS, µPAS and µC languages which are included in LaFac are in the average (self-satisfaction !). I am even very happy to see that iziBasic is the best among the well-known Basic tools, but with less GUI functionalities. So, where is the truth? By the way, is there a truth in this exercise? Taking into account this objective, I let you establish by yourself your very personal podium! How much of the job is CPU bound? How good is the look and feel of the resulting project? How compatible will it be with various Palm OS devices? How long has the tools vendor been around? Is he likely to be there for the full life cycle of my product? If you answer to this questions, you will find your truth. And they are many truths since we all are so different people. Let's also realize that we are very lucky to have such a choice of developement tools for our Palm devices! Only the final results have been put in this page. For the detail of the source codes, of the links to the development tools and the single results for all these tools, please refer to the Bench 2 source codes page. By the way, it is a very instructive exercise for the amateur developer as well as for the professional one, to read the source codes in the different languages. Therefore, I highly invite you to read them. If you would like to help me extend this list of already benchmarked development tools and are working on one which is not listed here yet or in a newer version, I would be more than happy if you get in touch with me.